The idea of running around on the beach halfnaked made me feel more than a little queasy before our holiday. Wearing a bikini is not on my top 10 list of favourite activities anyway. So how would it feel with a massive belly? My safety net: this kaftan from Rodebjer, which doesn’t just cover the bump but the two metric tons of Rittersport whole almonds I somehow must’ve eaten since becoming pregnant. Turns out that I’ve never felt as comfortable in a bikini as I do now. On the one hand: Hello, Pamela Anderson (and a bum the size of California)! On the other hand: So what? I’m almost eight months pregnant. The bigger I’m getting, the less self-conscious I feel about my shape, something which used to occupy my thoughts a lot more before. As I keep growing so does the realisation that my body is building a new person. An endeavour that requires a lot of energy. And mass. I’m constantly amazed that I’d be capable of something like that. A human powerhouse. I’d be lying if I said that there aren’t also those days when I look down from my desk and think: excuse me, who do these thighs belong to? When I get frustrated with my lack of fitness and I ask myself if I’ll ever have something resembling a biceps again. Then I try to tell myself that yes, I will. Probably when I start carrying around a little bundle all day in about two months time. For every tight t-shirt I’ve started wearing that shows off my belly, something I’d never have felt comfortable doing before, I still love this kaftan. Not because it hides me. But because it’s light, easy and beautiful. And still will be once I’m not waddling belly first through life anymore. 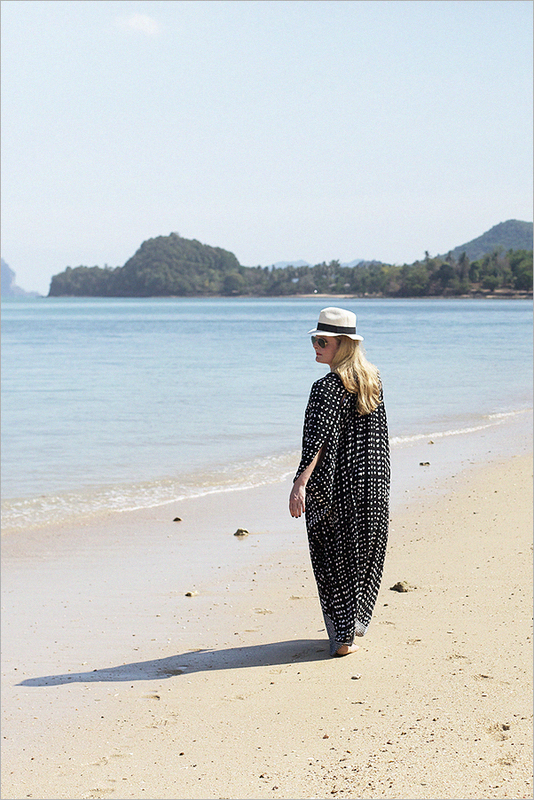 This entry was posted in fashion, hers and tagged kaftan, Koh Yao Noi, Koyao Island Resort, pregnancy style, Rodebjer, Travelogue. Bookmark the permalink. Post a comment or leave a trackback Trackback URL. Witzig, oder? Ich habe mich im Bikini mit 6-Monats-Kugel auch so wohl gefühlt wie nie zuvor! Hoffe, Ihr erholt Euch gut! Der Kaftan ist übrigens ein Traum! Leider nicht mehr in schwarz-weiss erhältlich…und gerade das sieht sooo(!) toll aus! Been there, done that. Und die Stillzeit bringt einen weiteren Freiessschein 🙂 Bei mir gingen Bauch und zusätzliche Kilos allein. Nur Flatterarme und Hautschwabbel muss jetzt auf die Pelle gerück werden. Genießt den Urlaub!